I was forwarded this email by an environmental colleague (See below for email and those on the email, primarily folks like Dupont, the Chemistry Council and Petroleum Council lobbyists, and consultants). I have gone to SRAG meetings in the past, which have been open to the public and included a public comment opportunity. Given the importance of the agenda items, particularly the DEP’s new draft Remedial Priority System, I decided to attend and report to the public about these issues via this blog. I arrived at the DEP building, signed in, and entered the meeting in DEP’s public meeting room. There were well over 50 people in attendance, mostly consultants and LSPs. While I was having an informal conversation with a Deputy Attorney General, DEP Security advised me that Commissioner Martin directed me to leave the meeting. I asked him on what basis this Order was issued and was told the meeting was by invitation only. I replied that if this were the case, then Martin should try to enforce that restriction, as I was under the impression the meeting was open, and not by invitation, having attended open SRAG meetings before. Other NJ environmentalist were invited, so this was not a private confidential industry only meeting. Shortly thereafter, 3 state police officers showed up, directed me out of the public hearing room, told me that Martin has asked them to eject me, and took my personal identification information for their police action report. Today’s over the top use of State Police is part of a troubling an unacceptable pattern by Martin to shut down public involvement in DEP decisions. I am writing to condemn your decision to ask the State Police to eject me from the Site Remediation Advisory Group (SRAG) briefing by DEP staff, which was held today at DEP’s public hearing room. Such heavy handed tactics are un-American, and have no place in state government. 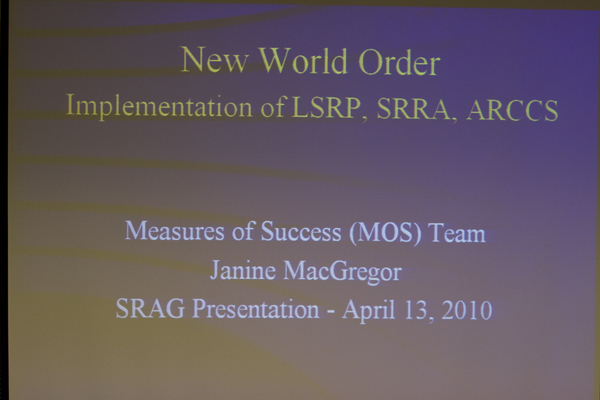 I have attended SRAG meetings in the past. I testified throughout the legislative debate on the Licensed Site Professional bill, the subject of today’s briefing. I testified in the legislature specifically on the topic of the risk based priority system, which also was on today’s briefing agenda. I received the DEP’s email invitation last week, which was forwarded to me by an environmental colleague. So the meeting was open to other environmental and public interest advocates. There were dozens of people in the room. No DEP staffer requested identification at the door to assure that all in attendance were on an invitation list. So it is obvious that I was targeted for removal. It is also obvious why I was targeted, because I am an intense, vocal, and visible advocate of the public interest and transparent government. In light of this episode, I ask for your support towards reforms to make all DEP advisory group deliberations are open and accessible to the public, transparent, accountable, objective, and subject to ethical standards, as provided by the Federal Advisory Committee Act (FACA). I’ve heard from colleagues that there is a rumor in DEP that I was ejected for being disruptive. That is not true. Martin ejected me solely because he claimed (falsely) that the meeting was by “invite only” and that I was not invited. I was doing nothing at the meeting that could warrant ejection, in fact the meeting had not yet even started. I will post the State Police incident report in a week or so to prove all this. Come on, DAG George Schlosser – you are my witness! Weigh in here! Was there a public notice for this meeting? No public notice required, Ed. Public notices are generally required when for agency regulatory action is the topic. This was a PUBLIC ADVISORY Group – look at the email kist o invitees – several environmental organizations were invited. AS I note, SRAG meetings in the past have been open to the public, even with a public comment period. BTW< there is federal law governing similar federal advisory committees. FACA (see letter to Martin above). There should be a similar state law.